Introduce a curious young child in your life to the classic tales of one very lovable and mischievous monkey! 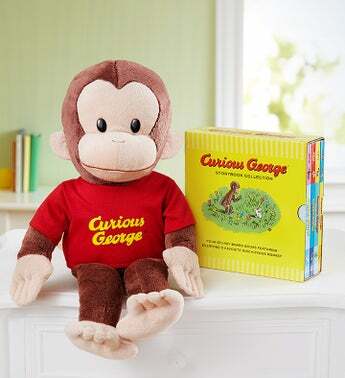 Our Curious George gift set includes a cuddly plush Curious George Gund™ monkey, dressed in his signature red t-shirt. He’s joined by a collection of four beloved board books, with the original art beautifully restored and redesigned for a modern look. Perfect for story time or bedtime, this cherished collection will delight a new generation of fans, as it has for more than 75 years.